"The decision to start an orchard involves a decision to stay put. The first plant you want to get rooted in the earth is yourself. That's what makes home orchards so valuable; where they abound, they speak eloquently of a stable and responsible community, the first necessity of a healthy civilization and a happy culture." I've owned a copy of Gene Logsdon's Organic Orcharding since I was in high school, but I don't think I ever read it until this year. I do recall flipping through the book and dreaming about my very own fruit trees, but am pretty sure I skipped the all-important chapters on pest control and didn't read the other how-to chapters with a very critical eye. So I figured it was time for a more thorough re-read. At the time, I also didn't realize that Gene Logsdon was one of the great homesteading authors who writes from personal experience, but with a dash of experimental optimism. In fact, having read at least half a dozen of his books so far, I'd say that Organic Orcharding is possibly his best --- too bad it's out of print! Luckily for you, I plan to sum up the highlights in this week's lunchtime series. Stay tuned! I agree, Organic Orcharding is an excellent book. Although out of print, it is very much available, and affordable. Amazon has 42 copies available, and Abebooks.com has 12 copies available, starting at $7.74 delivered. Walden Effect readers may be interested in Abebooks.com - an online clearinghouse for used booksellers, including many non-profit and charitable organizations. Some of those booksellers are the literary equivalent of "no-kill" animal shelters. They use their sales revenue to send books to institutions world-wide (not everyone has internet yet) as an alternative to recycling unwanted books for their fiber content or burning them for their thermal content. I am a great fan of Amazon, for more reasons than I can list here. Amazon has revolutionized publishing and retailing, benefiting both consumers and producers. Living more than 20 miles from town, Amazon Prime saves us time, money, and motor fuel. However, Abebooks.com has also earned a place at the table, and I don't feel out of place recommending them as an alternative source for used books. Thanks again, Anna and Mark, for all that you share with us. I'm heading out to do chores. Harry has a great point about finding out-of-print books from alternative sources. I wanted to give a shout-out to one of my favorite alternative sources, too! Better World Books is a used book seller like a number of other sites, but has a core mission of promoting literacy around the world. They've donated millions of books to developing countries and set aside a significant portion of their proceeds to do so. I found them in college when they happened to be the cheapest source of one of the textbooks I needed. 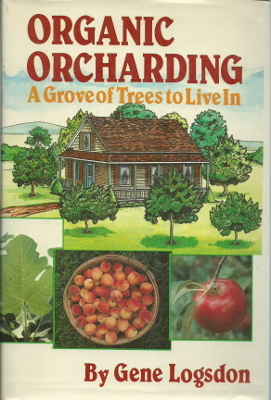 They also have a number of copies of Organic Orcharding, but they go up in price pretty quickly after the cheapest few. They also have a link to Anna's review from goodreads.com. I haven't read this book yet, so I'm excited to see what's in store for this weeks lunchtime series!